You could probably find pretty much anything you wanted to on Facebook, group-wise. Do you like to crochet? There’s a group for that. Big fan of Bullet-journaling? There’s a group for that. Enjoy photoshopped pictures of cats in ridiculous scenarios? There’s a group for that. In fact, there are even Facebook groups devoted to the latest phenomenon of criticizing the belongings of strangers. And the most popular thing people enjoy criticizing, or as it’s known to the cool kids, “shaming”, is wedding and engagement rings. Yeah… I know. 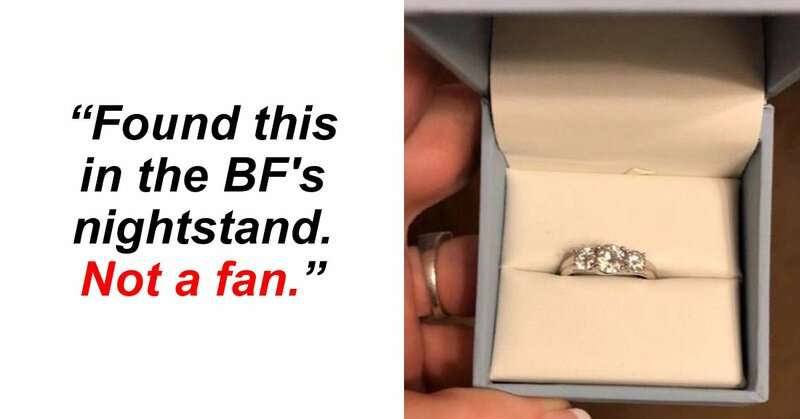 One woman, however, has recently taken the craze to a whole new level by not shaming a strangers ring, but by shaming herself in a now-viral Facebook post. As with most things that happen on Facebook, the post was also shared on popular site Reddit, where people were absolutely floored. Basically, what happened is the original poster found the ring her boyfriend planned to propose to her with (so sweet, I know!) in his nightstand… and she was not pleased at all. 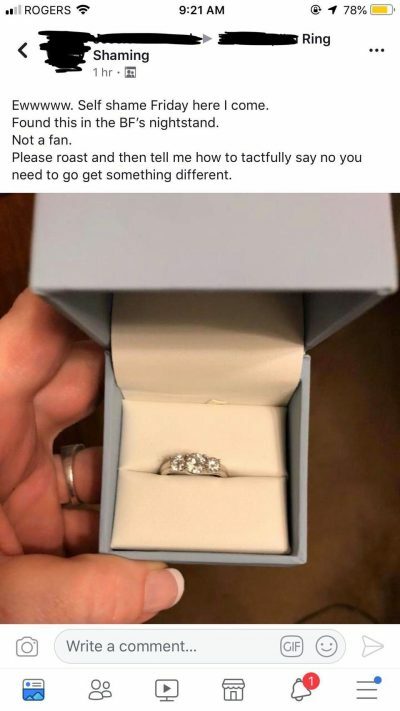 The woman’s name and the Facebook group in question have been blanked out, however, it appears that it’s a custom of the group to post your own ring on Friday’s in order to get yourself a nice healthy dose of self-deprecation. This screenshot, in particular, was posted to the subreddit r/Choosingbeggars and r/Nicegirls over the weekend, and it’s safe to say that people had a lot of… thoughts, on the matter. Understandably, many people thought that the (potential) bride-to-be had crossed a serious line. “What is it with engagement rings anyway? They’re not going to be worn for a very long time, they are replaced by yet another expensive ring, and some messed up guides claim you should pay around a month’s income on one. Money that could be invested in a bigger, better wedding, or a couple vacation, or savings account for the couple’s future kids,” another commenter wrote. “This lady deserves to get shamed not the ring,” one user joked. “I think she’s justifiably asking for advice. ‘How do I tactfully say no, you need to go and get something different?’ And the answer is for her to say ‘Hey hun, you should go and get some different girlfriend,'” one person on the Choosing Beggars subreddit said. And there were also several people who commented that ring-shaming groups an incredibly unhealthy culture… and I am 100% here for those people. “You could literally give me an onion ring and I would marry your a– if I was truly in love with you. What’s wrong with some entitled people?” another person wrote. Well, I know who’s side I’m on, how about you! ?